(AINA) -- Freelance journalist Nuri Kino continues reporting on Sweden's illegal deportation of Iraqis. He is now working with Karin Wirenhed. They have produced one of the strongest reports for Radio Sweden this year. The Council of Europe has demanded the Swedish government stop the deportation of Iraqis. One of the Iraqis that has been forbidden to remain in Sweden is Riyad. He is a Christian Assyrian and has worked for the U.S. Army in Iraq. The name Riyad is an alias for the purposes of this story. In Nuri Kino's program the voices of the interpreter and the official working for the Swedish Migration Board was replaced so as not to identify the actual individuals. Kino and Wirenhed's program dealt with the Swedish Government's illegal deportation of Iraqis and not about officials working for the Migration Board who may have erred in their work. It is difficult to reproduce a powerful radio report in writing but AINA thinks it is important the message be told. Below you will read a partial transcription and translation of what began as a secretly recorded interview between Riyad and an official from the Swedish Migration Board. Riyad: They murdered my brother and would have done the same to me; they can also do the same to me. Swedish Official: Yes, I know that but it doesn't count that they might do the same to you but you have to prove that there is an actual threat and that it has a certain intensity and scope. Riyad and his brother both worked for the U.S. Army. His murdered brother worked as an interpreter. He also operated a shop on the military base where Riyad was employed. It suddenly came to an end in September 2004 when Riyad's brother was kidnapped. Riyad tried to negotiate with the kidnappers by telephone but instead of negotiating he was threatened. Less than a week later he was forced to go to the hospital in Mosul to look for his brother. Among the corpses he immediately recognized his brother's clothes, but the head was missing from the body. In Mosul it was generally known what had happened to Riyad's brother because the murder was videotaped and the DVD was distributed to Assyrians to scare them. We have a copy of the DVD. It's not more than 10 minutes long. At the beginning, Riyad's brother is sitting on a stool. You can clearly see on his face the beating he received; one of his eyes is swollen closed and badly bruised. With his eyes staring at the camera he is forced to say that he is a traitor and a spy since he worked for the American occupation. Then the picture goes to black. When the camera is turned on again the brother now sits with a white blindfold over his eyes. Four men in black masks stand behind him. One of the men reads his death sentence. What followed is too gruesome to describe. When it was over, the brother's head is held up as a trophy, without the blindfold so that everyone could see who it was. Riyad gave a copy of this DVD to the Migration Board in a sealed envelope. The seal was never broken. No one ever looked at it. They said it wasn't necessary since neither the Migration Board nor the Migration Court doubted what happened to Riyad's brother. What the authorities questioned was whether it is still dangerous for Riyad to return to Iraq. Riyad has tried to convince them that his life is in danger. He proved that his brother's kidnappers wrote to him that it doesn't matter where he tries to hide, they will find him and kill him. He has sent the Migration Board a letter in which he stated that his entire family is threatened. His lawyer has submitted an actual death list where Riyad's name is number six. According to the Migration Board, his lawyer has done a thorough job. In the official file it states that he has devoted more time to this case than was demanded from him. Riyad's case has been tried in every court, every level and authority in Sweden. Last month he received his final rejection. He does not have the right to receive asylum in Sweden. It is possible that the United Nation's Refugee Commission would have judged his case differently since Riyad's entire family, including another brother who did not work for the American military, have been accorded refugee status by the UN in Syria, to where they have fled. "Yes, you now have two fears instead of one which you can only blame on yourself since you refused to cooperate by voluntarily returning to Iraq." After this decision Riyad gone into hiding. He has moved from his official address to a hidden one-room flat where he sleeps on a mattress on the floor together with two others in the same predicament. He relates that he hasn't slept for several nights. Every time he closes his eyes the film with this brother's mutilation plays out in his mind. It is hard for him to forget how his brother looked when he found him in the morgue. Riyad is trying to obtain a receipt from a physician. He has to take sleeping tablets and anti-depressants and calming medicines. They drugs are soon exhausted and since he remains in Sweden without permission he has no right to obtain any more. On the stove, Riyad prepares Arabic coffee. In the kitchen there are four worn barstools that they found in the trash. The window ledge functions as a table. We wondered if there was anywhere in Iraq where he could feel safe. "I don't have to remain here," he tells us, "just send me anywhere in the world except Iraq." We phone Pascale Warda in Baghdad. She had earlier served as Migrations Minister in Iraq and now works for the Hammurabi Foundation, which is dedicated to helping refugees. She knew about the murder of Riyad's brother and tells us that it is impossible to protect anyone that has been returned to Iraq by force. "But the Swedish government still continues to deport them by force all the way here. 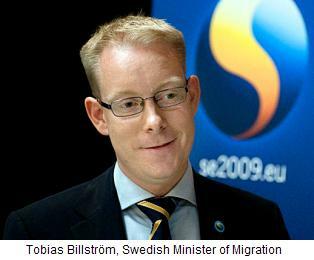 Your Migration Minister Tobias Billström lives in a dream world, Pascale Warda stated. We only wish we could welcome them but the situation here is impossible." She continued: "I think that it is vital to point out that everyone should come to Iraq but, for the moment, the country has no re-immigration policy. There is no safety for those who return, no way of obtaining security. First our government should have a plan to identify returning citizens so that later Sweden and other countries can cooperate with Iraq and begin to return Iraqis. No one should be deported by force especially if one is threatened in Iraq; as I said earlier, there is no security available in Iraq today." The Council of Europe demands that the Swedish government acts against the Swedish Migration authorities and according to the critics that Sweden has received from UNHCR because Sweden forcibly expels Iraqis. But Migration Minister Tobias Billström does not understand why. "I want to point out that Sweden has invested a great deal to establish a just and well functioning system for the asylum of refugees that is built up on the basis of individual test cases," Billström said, so I find it a bit difficult to understand these points of view." If the government doesn't do anything about this, UNHCR's authority in international migration questions will be undermined, emphasized Thomas Hammarberg, the Council of Europe's commissioner for human rights. "When European governments, including the Swedish government, now begin to dismiss the serious warnings that are coming from the UN's Commission on Refugees, they are simply taking a very large risk by not only endangering individual people's lives but also undermining the UN system as regards protection for refugees in other parts of the world." Riyad is one of those who Thomas Hammarberg feels is risking his life in Iraq. "How can the applicant (Riyad) show more than he has already done that the threat is serious? This is further proof that the system does not work in practice," Hammarberg maintains. Pascale Warda, speaking over the telephone from Baghdad, says Sweden has the responsibility of protecting Riyad until the situation in Iraq improves. "I mean that his life is in danger the entire time. He needs protection by the Swedish authorities, at least temporarily, until the situation changes." Award winning journalist Nuri Kino is one of the leading experts on Iraqi refugees and the consequences of the war in Iraq. He has testified twice before the Swedish Parliament. Together with the American journalist David Kushner he has written an international thriller, a novel that will published in Sweden in September. The novel, The Line in the Sand has been been warmly received American experts in history and politics and has been called "a must read!" The Line in the Sand deals with the political schemes behind the ongoing ethnic-religious cleansing in Iraq. The book will be launched internationally in October 2010.